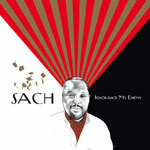 Limited edition of 300 copies of Sach's ''Ignorance My Enemy'' album on proper vinyl. Another lo-fi affair by one of the most talented MCs from the west. Artwork is once again provided by the one and only Ian Johnson.